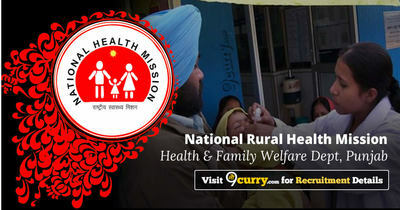 NRHM Punjab Recruitment 2019 - Below are various recruitment notifications published by National Health Mission, Punjab / www.pbnrhm.org. As of now, we don't have any active recruitment notification by NRHM Punjab featured here. We may update as soon as the organization announces a new job notification. If you are looking for any information related to previously organized recruitment drives by NRHM Punjab, you can browse through previous job notifications mentioned below and get the new updates or information you are looking for. NRHM Punjab Recruitment 2019 - Apply Online for Apply Online for 297 Medical Officers Posts (Walk-in) in NRHM Punjab, Punjab. Online Applications are invited by National Health Mission, Punjab from 18 Feb 2019 to 26 Feb 2019 03:00 PM and Interview held on 02nd & 03 Mar 2019 10:00 AM for 297 vacancies. NRHM Punjab Recruitment 2019 - Apply Online for 107 Computer Operator Posts in Department of Health & Family Walfate, NRHM Punjab, Punjab. Online Applications are invited by National Health Mission, Punjab from 25 Jan 2019 to 12 Feb 2019 for 107 vacancies. NRHM Punjab Recruitment 2019 - Apply Online for Apply Online for 11 Medical Officer Posts in NRHM Punjab, Punjab. Online Applications are invited by National Health Mission, Punjab from 09 Jan 2019 to 25 Jan 2019 for 11 vacancies. NRHM Punjab Recruitment 2019 - Apply Online for 6 Month Bridge Program (Certificate) in NRHM Punjab. Online Applications are invited by National Health Mission, Punjab from 05 Jan 2019 to 25 Jan 2019 till 05:00 PM and Written Test to be held on 31 Jan 2019 for 800 Seats. NRHM Punjab Recruitment 2019 - Walk in for 12 Radiographer Posts in Department of Health & Family Walfare, NRHM Punjab, Amritsar, Fatehgarh Sahib, Fazilka, Jalandhar, Moga, Pathankot, Patiala, Punjab on Contract Basis. Candidates are invited by National Health Mission, Punjab to attend walk-in-interview to be held on 20 Mar 2019 at 10:00 AM for 12 vacancies. NRHM Punjab Recruitment 2019 - Walk in for 22 Occupational Therapist Posts in Department of Health & Family Welfare, NRHM Punjab on Contract Basis. Candidates are invited by National Health Mission, Punjab to attend walk-in-interview to be held on 22 Mar 2019 at 10:00 AM for 22 vacancies. NRHM Punjab Recruitment 2019 - Walk in for Data Manager, Entomologist & Epidemiologist Posts in Department of Health & Family Welfare, NRHM Punjab, Punjab on Contract Basis. Candidates are invited by National Health Mission, Punjab to attend walk-in-interview to be held on 18 & 20 Mar 2019 at 10:00 AM for 9 vacancies. NRHM Punjab Recruitment 2019 - Walk in for 12 Radiographer Posts in Department of Health & Family Walfare, NRHM Punjab, Punjab on Contract Basis. Candidates are invited by National Health Mission, Punjab to attend walk-in-interview to be held on 20 Mar 2019 at 10:00 AM for 12 vacancies. NRHM Punjab Recruitment 2019 - Walk in for Assistant Hospital Administrator Posts in Department of Health & Family Welfare, NRHM Punjab, Punjab on Contract Basis. Candidates are invited by National Health Mission, Punjab to attend walk-in-interview to be held on 13 Mar 2019 at 10:00 AM for 9 vacancies.